No other ruler in England's long and varied history has been honoured with the title the Great. Alfred once declared it his intention "To live worthily as long as I live and after my life to leave to them that should come after, my memory in good works." Few of our monarchs have succeeded as spectacularly in their aims as he did. Alfred (Old English-Aelfred) was the fifth and youngest son of Ethelwulf of Wessex and his Jutish first wife, Osburh. He was born at Wantage between 847 and 849. His birthplace was a palace or vill which lay at the foot of the Berkshire Downs, which has now vanished. Ill health is reported to have marred Alfred's childhood. One of the few stories that survive from Alfred's early life relates that his mother, Osburh, showed her sons a beautifully illuminated volume of Saxon poetry and promised to make a gift of it to the first of them who was able to read it. Alfred quickly learned to read it aloud, and was made a gift of the book when he was only six years old. His youngest son appears to have been Ethelwulf's favourite, his father took Alfred on pilgrimage to Rome, to receive the blessing of his godfather, Pope Leo IV. It was rumoured that King Ethelwulf wished to make Alfred his successor. On Ethelwulf's return to England he found his eldest son, Ethelbald, had usurped his throne in his absence. Nobly accepting the status quo in the hope that civil war and the consequent loss of life could be avoided, Ethelwulf retired to Kent, where he reigned as sub-king until his death in 858. Alfred was around eleven when his father died. He was studious as a child and grew to be a man of determination, intelligence and resolution, despite suffering from ill health for much of his life. Alfred's three elder brother's reigned in turn before him. During the reign of the youngest of these, Ethelred I , Alfred emerges from the mists of obscurity to fight loyally by his side in the struggle against the Danish incursions into Wessex. At the Battle of Ashdown, in the Vale of the White Horse, the pious Ethelred remained so long in his tent praying for victory that Alfred became impatient and led his men in a furious charge at the enemy without waiting for his brother to finish his prayers. The Witangemot, or Saxon council of wise men, met after Ethelred's death from wounds sustained in battle and elected the twenty-two year old Alfred, who had already demonstrated himself a confident leader of men, as King. His brothers between them, had lasted barely a decade. In electing Alfred king the Witan passed over the two young sons of Ethelred. The law of primogeniture was not then established in Saxon England and it was normal practice for the King to be elected in this manner. The practice of crowning a successor as royal prince and military commander is well-known among Germanic tribes. The depressing series of defeats at the hands of the Vikings continued unabated and Alfred was forced into a strategy of buying them off. As a result they ceased their attacks and for a period of five years, peace reigned in Wessex. This peace was not likely to last for any considerable length of time and was at best a temporary measure. The Viking army, after taking Mercia, divided. One part, under Halfdan Ragnarsson, marched north to Yorkshire where they settled permanently. The other, under Guthrum, launched another attack on Wessex in 875. They withdrew again in 877 and began to colonise Mercia. Wessex was savagely attacked for the third time in 878 and Alfred was driven into hiding at Athelney in the Somerset marshes, he remained there with his ally, Athelnoth, Ealdorman of Somerset and others of his thegns, and waited. Legend has it that in his preoccupation with the defence of his kingdom, he famously burnt the cakes and was set upon by an angry housewife. In 1693, a remarkable discovery of a Saxon jewel was made at North Petherton near Athelney, in Somerset, now known as the Alfred Jewel. As the Jewel contains no fastening, it is not thought to be a brooch or a clasp. It is probable that it formed the crown of a writing instrument. The Alfred jewel made of gold and enamel, bears the Anglo - Saxon inscription 'Aelfred mec heht gewyrgan' (Alfred had me made) Click to enlarge. 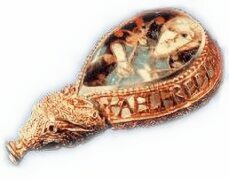 The Alfred Jewel is about 2 and a half inches (6.4 cm) long and was made of filigreed gold, enclosing a highly polished tear-shaped piece of clear quartz 'rock crystal', beneath which is set a cloisonné enamel plaque, with an image of a man, perhaps Christ, with ecclesiastical symbols. An animal head at its base has as its snout a hollow socket, showing that it was intended to hold a thin rod or stick. The back is a flat gold plate engraved with an acanthus-like plant motif. It seems to have been one of the precious 'æstels' or staffs that Alfred is recorded as having sent to each bishopric along with a copy of his translation of Pope Gregory the Great's book Pastoral Care, saying in his preface to the book-"And I will send a copy to every bishop's see in my kingdom, and in each book there is an aestel of 50 mancusses and I command, in God's name, that no man take the staff from the book, nor the book from the church". IN 886, Alfred garnered his resources and managed to retake the city of London, but Viking raids continued. At the Battle of Edington in 878, Saxon forces soundly defeated the Vikings led by Guthrum and peace was concluded by the terms of the Treaty of Wedmore. 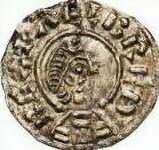 Guthrum converted to Christianity with Alfred standing as godfather to his erstwhile enemy. Alfred accepted the Danish colonisation of much of England. A line was drawn which ran north-westwards from London to Chester, defining an area north of this line which was termed the Danelaw. Alfred improved his army, making provision for it to be always availiable at short notice to defend Wessex. Part of the army was always kept in reserve in case of emergency. The navy was similarly improved, building ships which were bigger and better than those possessed by the Vikings. King Alfred built up defences and fortified townships to ensure the safety of his people. He established defended settlements, or burhs (from which derives the modern borough) These settlements were recorded in detail in the Burghal Hidage. A network of burhs was established to ensure that no part of Wessex was further than 20 miles from these strongholds. By 897 he had successfully halted the advance of the Vikings, a remarkable achievement. The King turned his attention to the deterioration of learning in England. Due to the continued pillage of monasteries by the Vikings, which essentially formed a network of rudimentary education at the time, educational standards had diminished. Alfred founded a court school to educate the nobles and encouraged the great scholars of his day to take up residence in England. "It is most needful for men to know" he is recorded as stating "and to bring it to pass, if we have peace, that all the youth now in England-may be devoted to learning." The royal court was to become a magnet for scholars. On the insistence of the King, English became the official written language. Alfred personally translated into English 'The History of the Venerable Bede', 'Boethius's Consolation of Philosophy', 'Dialogues of Gregory the Great', Gregory's 'Pastoral Care'. and Orosius' Soliloquies of St. Augustine'. Prior to this, all books had been written in Latin. Alfred is also noted for beginning the Anglo-Saxon Chronicle in the 890's and had many copies made. The chronicle was written in Anglo-Saxon, rather than the usual Latin. Alfred decreed that these copies be placed in monasteries and churches and frequently updated. The chronicle was updated until the twelfth century, some of the original copies still survive to the present day. It remains one of the few literary sources we possess for English history from the departure of the Romans to the Norman conquest. Alfred established a legal code, forming a body of Saxon law, based on the laws of Offa of Mercia, which limited the practice of blood feuding and imposed heavy penalties on those in breech of sworn oath. "I ... collected these together and ordered to be written many of them which our forefathers observed, those which I liked; and many of those which I did not like I rejected with the advice of my councillors ... For I dared not presume to set in writing at all many of my own, because it was unknown to me what would please those who should come after us ... Then I ... showed those to all my councillors, and they then said that they were all pleased to observe them" (Laws of Alfred, c.885-99). Throughout his life, Alfred had suffered from a mysterious illness, about which little is known with certainty, but which left him incapacitated for long periods. This is one of the most puzzling and often discussed areas of Alfred's life. Bishop Asser informs us that Alfred suffered bouts of depression after each attack. The first attack apparently occured at his wedding. 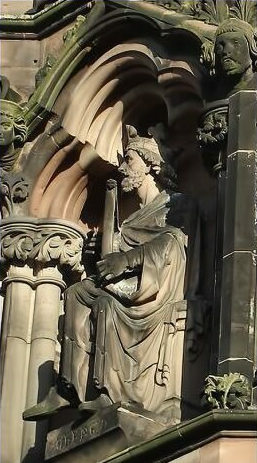 Asser describes Alfred’s symptoms, terrible intermittent pains, difficulty riding a horse, it is now hypothesised that his illness may have been Crohn's Disease, which may have been inherited by his grandson King Edred. Alfred died at Wantage in 899 at the age of fifty-three. He remains the only English sovereign ever to be given the epithet the Great, which was bestowed on him in the seventeenth century. 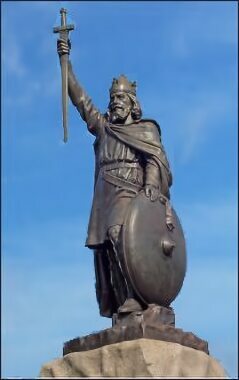 "Alfred the King of the Anglo-Saxons, the son of the most pious King Ethelwulf, the famous, the warlike, the victorious, the careful provider for the widow, the helpless, the orphan and the poor, the most skilled of Saxon poets, most dear to his own nation, courteous to all, most liberal, endowed with prudence, fortitude, justice and temperance; most patient in the infirmity from which he continually suffered; the most discerning investigator in executing justice, most watchful and devout in the service of God." Many of our Kings could not wish for a finer epitaph. During King Henry VIII's dissolution of the monasteries, Hyde Abbey was ransacked and destroyed, in common with other religious houses, leading to the mystery over the whereabouts of Alfred's remains. Tradition states that the graves of Alfred and his family were not disturbed, but were unearthed and later pilfered during construction of the town jail in 1788. A vicar reputedly bought the bones. However, recent radiocarbon dating of the contents of this burial indicates that this was not the case, when the the bones were found to date only from the fourteenth century. After this initial disappointment, attention was turned to bones in storage boxes at the Winchester City Museum that had been excavated from Hyde Abbey in the 1990s, when an excavation at the site confirmed where the tombs once were, the spot is now marked by stone slabs. Archaeologists have announced that radiocarbon dating of a fragment of human pelvis excavated in Hyde Abbey is 'very likely' to be part of the remains of King Alfred the Great, or his son Edward the Elder or the brother of King Edward, Æthelweard, all of whom were buried at the Abbey. The bone fragment belongs to an adult male aged 26-45, who died in AD 895-1017. The individual had originally been laid to rest near the abbey's high altar, a prestigious position.